Built by the Soranzo family and also known, since the 10th century, as the Cà Grande di San Samuele, this palazzo was remodelled over the centuries by its owners, the Capellos and the Malipieros (who gave it its current appearance in the mid 18th century). Since the 19th century it has been owned by the Barnabòs, who restored it in 1951. It boasts one of the few gardens on the Grand Canal, a delightful oasis of greenery that occasionally hosts openings at the nearby Palazzo Grassi). There are lovely photos of the gardens here. Currently parts of the palazzo are used as exhibition space and as short term rental apartments. 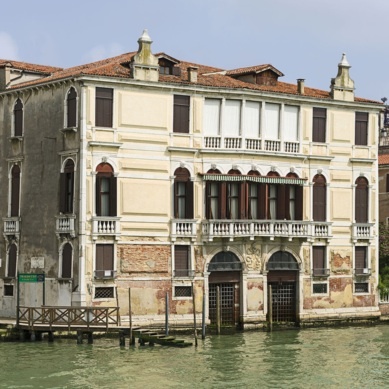 If you stay, you may be sleeping where Giacomo Casanova slept, and where he got up to an early spot of hanky panky as a teenager. The then owner, 76-year old Senator Alvise Gasparo Malipiero was the first of many patrons who fell under Casanova's charm and wit. The Senator made the young man his protegé, introduced him to important people and taught him how to behave in society—until he caught him dallying with his fellow lodger, the young actress Teresa Imer, the object of the Senator's own lust. The furious old man threw them both out of the house.